This tour is an adventure into the rain forest mountains of far north Queensland and is set at a leisurely pace with lunch included in the tour. The first stop is Jourama Falls; a beautiful picnic area and nature walks await, there is fresh water holes for you to immerse into or simply dunk your feet in, a magnificent waterfall to view, scenic bush trails and the sounds of nature which creates a calm cool refreshing environment for you to unwind and relax. The second stop is in Ingham, fondly known as little Italy. They call into a local Italian cafe for lunch and take a walk to view the history of Ingham via a 50 metre mosaic art work that is truly wow! The third stop is Wallaman Falls; this waterfall has the longest drop in the southern hemisphere and is breathtaking. You will travel to the lookouts that show case this magnificent waterfall and a valley that travels as far as the eye can see! Then its a short drive to the picnic area where you can feed the turtles, explore the rain forest trails and swim in the fresh water holes. Explore nature, discover Ravenswood, experience history. Ravenswood is fondly called the ghost town that wont die. It's an experience that takes you back in time to a historical gold mining town set in a serene natural environment. The tour offers a passionate tour guide that takes guests on a relaxing and informative journey where you discover natural wonders, explore heritage listed buildings, hear of a tales from another era and how life was in the times of the gold rush era and more. There is still plenty of heritage in Ravenswood to make you feel you have stepped back in time. You are shuttled around in an air-conditioned bus to all of the attractions where you can explore each one at your own pace, there is plenty to experience in this old town. Raven Tours offer a day tour and an overnight tour which also includes a sunset tour set in nature. It's an opportunity to relax and unwind in a time long gone. This tour is definitely one for the food lover! The itinerary has been carefully planned to include many of the hidden gems in the Hinchinbrook area. Supporting local, amazing food & wines to sample, discounted produce on the day, and no need to drive. 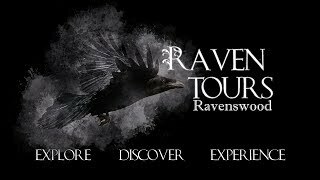 Raven tours have thought of everything, I highly recommend this tour for both tourists & locals. You will graze your way through the day tasting many varieties of food samples on offer and meet and greet the business owners as they tell you there stories of their business and produce.